Throughout my coversation with Douglas Engelbart, not once did I come across any negativity within the grand old of computing. Honestly, I had expected him to be angry, to be unhappy, to be frustated, the way world has really treated this genius. After all, most of the amazing computing innovations (from hyperlink to GUI) today can be traced to that December night in 1968, the day of ‘mother of all demos’. Engelbart not only saw the future much before every any one else did, but also gave us a glimpse of it. In many ways, he is the Nostradamus of the IT industry. Nonetheless, while people built upon the foundations laid by Engelbart, he was relegated to the sidelines. Even when he confesses of being a bit sad, he blames himself for it. “Well it is your fault Doug, you don’t know the rest of the world well enough to be able to be able to communicate and make them see what you do,” he says. Nonetheless, even today Engelbart comes to his Bootstrap office and continues to work on projects that promise to revolutionize the future. Getting to speak to Engelbart, was a dream, especially, because, he spoke to me in detail. I was asking him rather inane questions on Collective IQ, and like an indulgent grandfather he would patiently answer all of them. Because of such ocassions, the chance to interact with a pioneer like Engelbart, that I truly love my job. Sometime during our conversation, I informed Engelbart that my name (Shashwat) means immortal, and he retorted that his surname Engelbart in Germany, means an angel’s hair. “Which is also immortal,” he quipped. I hope that he continues to stay with us for a long time, much like an angel’s hair, and sees his dream of Collective IQ become a reality. ’Twas a wintry December Monday in 1968, when 43 year old inventor Douglas C. Engelbart dressed up in formals took to stage in the Fall Joint Computer Conference in San Francisco. Wearing a headset, Engelbart gave a demonstration of a project titled “Augmenting Human Intellect” that he and his team had been working on at the SRI Campus in Menlo Park, California. In some 90 odd minutes, Engelbart completely changed the way people perceived and would perceive computers henceforth. Through the numerous inventions that debuted that day, like the hyperlink, graphical user interface, an online system – NLS, object addressing and dynamic file linking, and amazingly communication over a network with audio and video interface (later to be known as video-conferencing) and not to forget the groovy mouse. By showing how he could manage his shopping list (frequently updated by wife) on a computer screen through links and charts, Engelbart liberated the computer from the labs and brought it within the realms of what he called the ‘knowledge worker’. Little wonder Engelbart’s demo has ever since been referred to as the Mother of all the Demos. It has been some 40 years since that penultimate night and the world has changed so much. Still Engelbart continues to toil. The man, who shared tomorrow some 4 decades back, has still a lot to show to us. Renowned as the father of the mouse, Engelbart is without any doubt one of the greatest inventors of computing. But more than an inventor, he is also a philosopher, who finds metaphysical strains in his work. Even now, he is striving at the Bootstrap Institute, trying to show the world how human intelligence could be augmented through collective effort, what he calls Collective IQ. In a detailed discussion with Dataquest, Engelbart shared his vision of the future and also his hope that India would be a part of that vision. Excerpts. All those wonderful things that you demonstrated on 1968 are becoming real now. How do you feel about it, in the sense is it great to know that you were so ahead of your time or are you saddened by the fact that computer industry is achieving now all the things that you had laid out way back then? To be truthful, it really makes me feel inadequate. I have often wondered as to why I couldn’t explain all those advancements in ways that it could be easily understood by all. It is an overwhelming thought. 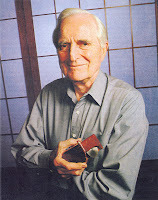 Nearly a decade back, there was an event organized that spoke about Douglas Engelbart’s unfinished revolution. What do you think is the current state of that revolution? I don’t have a short answer at all. It is trudging along, and what I miss is a chance for direct dialogue, I think about the basic concepts of what I call “augmenting our collective IQ”. I would really welcome a direct dialogue on what is collective IQ and what is augmentation believe that it is extremely important for human society to boost its collective IQ and look. I collectively at the problems and issues we face. It was in the sixties that you had spoken about augmenting human intellect through the use of machines. At times the implications of the same are not very clear, if you could talk of it? How do we move towards the state of collective IQ? Collective IQ is a capability level, there is a long road ahead and a great deal of evolution is needed. I have been studying literature and articles that talk of such capability and I hoped to hear echo of it by now. You must have seen from time to time these diagrams of the different functionalities that they have isolated in the brain. For instance, there are portions of brain that handle the sensory input, the others that handle logical reasoning. Haven’t you wondered that how effortlessly our brain processes information from different sensory organs be it audio from our ears or visuals from the eyes. How is your work at Bootstrap Institute that you founded some years ago, progressing? It has just faded away a lot because I am essentially working alone and by myself. Am old and not a very effective coordinator of things. I don’t really know what I should do to make more effective use of my dwindling energies. Many decades back with my team, I was the first one to build a hyperlink, I had wanted it to be able to address any object, and similarly I want to have discussions and debate on things that could take place. I remember the time when we were working on the GUI, one big domain was the different ways in which you could view a document, significant change to how you look and study a document. For instance you could see the 1st line of every paragraph in the document or you could view all the content. There could also be many ways to jump within a document, for instance a jump could be based on the occurrence of the given word. The computer can be truly creative device, it can provide a whole many ways to give a symbolic presentation of the knowledge that we are trying to deal with. What the human brain can achieve with visual and auditory perception, so can the computer without significant challenges. Honestly, we have only started with how the computer can augment ones capability, understand and communicate..
What is the status of the Open Hyper Document System that you had proposed? All these things have become stationary; because I am 82 and can’t keep running about to coordinate things. Why don’t you get India to get moving on augmenting human intellect and I could join in. I was very impressed a year or so back, the Prime Minister of India made a declaration that India will kind of look at boosting the collective IQ. The more I think about the size and opportunity and the general reputation that India has for intelligence and capabilities, the more hopeful I become of the potential of the country has. I don’t know of a country is as unusually placed as India, with its huge and educated population. It will be truly wonderful, if we could get something going in India. I hope that India will take a lead in the research of Collective IQ and the rest of the world will follow. At times, I feel embarrassed that I come to office day after day and haven’t done much about these projects. Why don’t we get it going? How soon can I start hearing from India that Collective IQ has become a nationwide movement. What do you feel about the commercialization of technology, the rush for riches and patents? I am not sure if there is any real option for the society except commercialization. What incentive would the inventor have to invent or how will an innovator be paid. I wish though that there were a lot more freedom for evolution and free. I just shrug and take things as they are. I remember people talked me into patenting the mouse. But I did not patent other things. Imagine what would have happened had I patented the idea of the link (hyperlink). Commercialization should not be the be-all of everything. How do you assess the current level of technology with powerful PCs with broadband Internet? I think it is very good and is touching a lot of people in the world. I think the valuable thing to do further research on how computing can be made more pervasive. I think the computer has far greater potential than merely emulating the page or something, but that is what is stuck in the paradigm of today. I don’t have a research team and I wish there was some way to get research going on the way that computer technology could provide new ways to read and modify text that books don’t provide. I feel there quite much in the way of effectiveness that could be done. You were also involved with the precursor of the Internet? Yes I was part of the ARPANET project. At that time, the idea of the Internet was much different from what we have today. The pitch was like you have some data on your machine and someone wants to access it, it could be done through the Internet. I remember two university researchers were there when the discussions were taking place and suddenly one turned to the other and asked “What is there on your computer that I could use?” And the other retorted, “Don’t you read my reports”. Thus genesis was simple. What I proposed to set up was a Knowledge Information System. I also read somewhere that you also hand a small role in the formulation of Moore’s Law? I had indeed mentioned that the chips will keep getting shorter and that the transistors on it would up exponentially, but I didn’t put a number to it. I remember in 1958, I was speaking at an event and was talking about dimensional scaling, making things smaller and smaller. I had done intensive research and gave a talk on it on a professional society and it turns out that Gordon Moore was there in the audience. And the Moore’s Law came later on. I believe that electronic components would indeed be smaller and smaller due to the hunger for new inventive things that we have. Do you believe that the digital divide between the haves and have-nots be ever bridged? Oh! I think it is inevitable with technology getting cheaper and cheaper for instance the $100 laptop that came out recently. I believe every one in Indian university could use the laptop and then it could percolate to the schools. I feel it is inevitable that computer will replace the book, so as to say. In a biographical sketch, your daughter had stated “people are looking at his past accomplishments while he himself continues to point to the future”. What do you say to that? That’s right there is so little dialog going on currently and that’s what I really yearn for. What really motivates you at this age? I hope that something can get going in the world and I want to stay alive and alert for that. I almost gave up publishing rather stupidly, you know I had indeed published fair amount but I didn’t seem to be able to make much difference..
Is there some sort of sadness that you have? I guess sadness may be appropriate. But then, I tend to say “Well it is your fault Doug, you don’t know the rest of the world well enough to be able to be able to communicate and make them see what you do”. So, at the end of the day that seems to be a pattern how I look at things. Do you not think that the invention of the mouse overshadows everything else done by you? Oh sure, it does overshadow, but it makes me very happy. Imagine a significant portion of the world’s population using my invention. It is hard for me to get used to it.